4. The Haida have oral history which tells of events that happened on this drowned grassland. The above excerpt from the well-known Raven-Travelling or Raven-Walking origin stories tell of a time of transformation, as Raven-Walking made the world the way it is – a coming-into-being of Haida Gwaii. 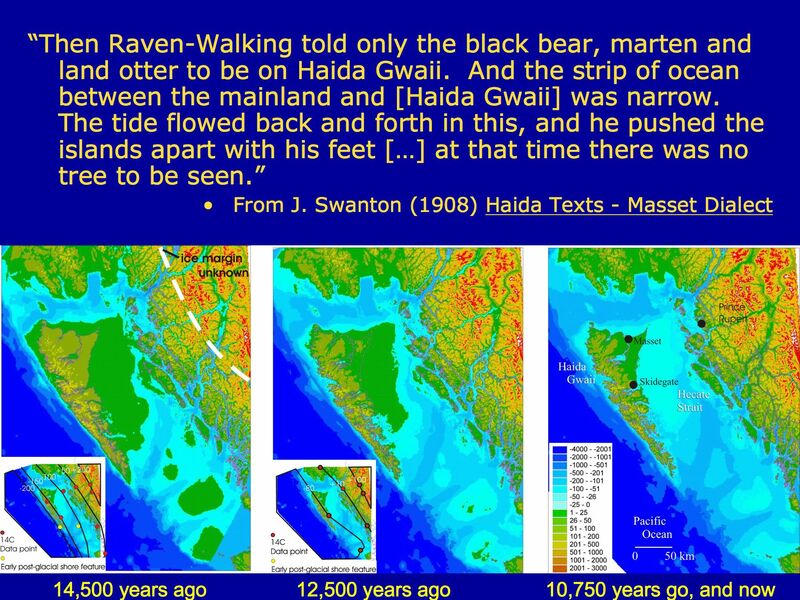 The congruence of the geological and oral historical information leads me to conclude that Haida storytelling extends to the terminal Pleistocene and thus spans more than 14,000 years of the history of these islands. Where else in the world can this claim be made so solidly? 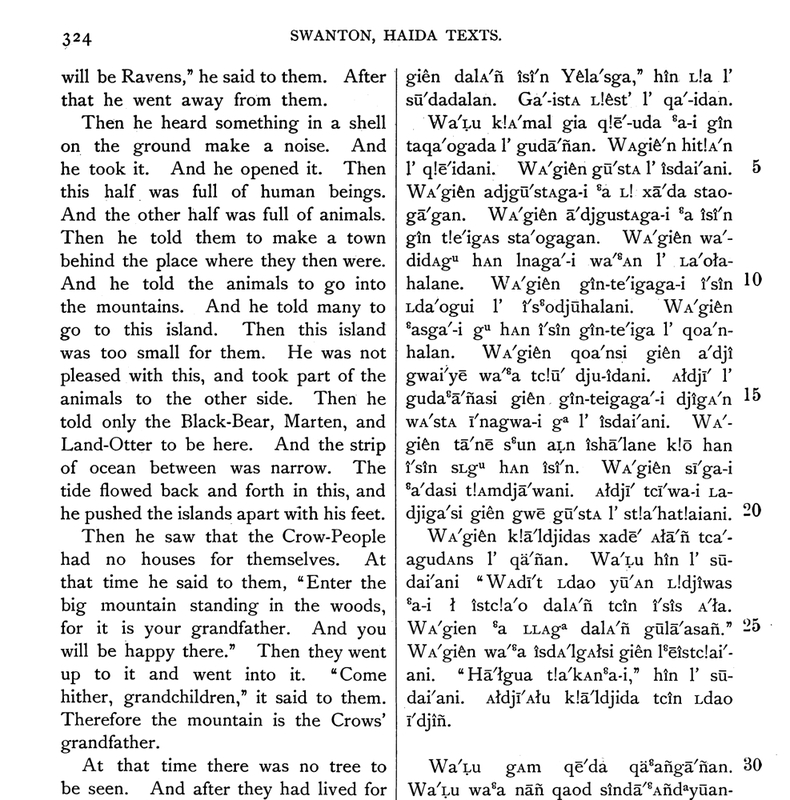 Excerpt from Raven Travelling as recorded by J.R. Swanton in the early 1900s (Swanton 1908:324). In the above excerpt, note that this is also the time of human emergence from the cockle shell at NaiKun, or Rose Spit, firmly placing these events at the “beginning of time”. The Haida emergence is one of the best known events in Haida history, being immortalized in a famous Bill Reid sculpture which also figures on the Canadian $20 bill. If you are wondering, the current earliest archaeological evidence for human occupation of Haida Gwaii comes from a series of karst cave excavations I worked on with Daryl Fedje and others: these solidly place people on the islands by at least 12,750 calendar years ago – a frame I expect to become even older as our research grunts along. Raven and the First Men, by Bill Reid. This entry was posted in anthropology, Archaeology, First Nations, Haida Gwaii, history, Northwest Coast, palaeontology and tagged Archaeology, First Nations, Haida, Haida Gwaii, history, Northwest Coast, oral history, palaeoenvironment, palaeontology, underwater archaeology. Bookmark the permalink. 1. Latest Scientific American with article by Heather Pringle. 2. Book by Daryl Fedje and Rolf Mathewes, 2005: “Haida Gwaii, Human History and Environment from the Time of Loon to the Time of the Iron People”. UBC Press. References in there will lead you to many interesting maps and discussions. Be ready, there are still many questions but no conclusion to that “routes” question. Yet.